Bodhi Linux is a new minimalistic Linux distro that uses the Enlightenment (E17) desktop. It's based on Ubuntu 10.04, however some packages have been backported from Ubuntu 10.10 - such as the 2.6.35 kernel. Also, the Enlightenment packages are updated weekly with new builds from SVN. The default Bodhi Linux theme looks very geekish, using black and green which at first I thought it would be annoying but I quickly got used to it and further more I ended up loving it by the time I've finished writing this post. Don't worry though, it can be easily changed if you don't like it from the Enlightenment menu. Even though it is minimalistic, Bodhi Linux tries to cover every little aspect to make your desktop experience enjoyable. And for everything else, the new online software center (which should be available soon - read on for more info) will allow you to install any extra packages you may need to further tweak or enhance Bodhi with minimum effort. Another aspect worth mentioning is the desktop effects which, having not used Enlightement for a long time, I forgot how cool they are. Don't compare it with Compiz - these are some simple transition effects but nevertheless very cool, especially since they can run on very low specs computers. However, if you want Compiz, you can have it in Enlightenment as long as your hardware supports it - see the following post: HOWTO: Enable Compiz under Bodhi (Enlightenment). To use Bodhi Linux, you need at least 128mb of RAM, a 300mhz processor and 1.5gb of hard disk space. The ISO itself is also very small - just 344mb. 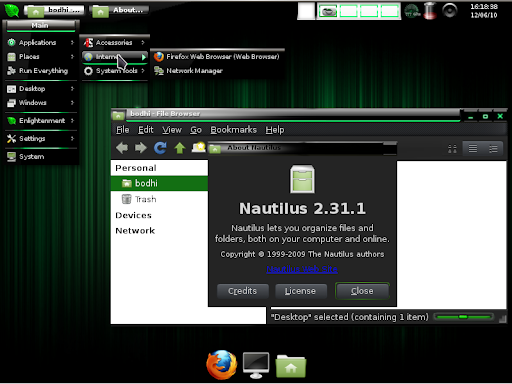 Because Bodhi was built to be a minimalistic Linux distribution, there are only a few applications installed by default such as Firefox 3.6, LX Terminal, Network Manager (it's using the Gnome Network Manager because the Enlightenment network manager wasn't working properly for everybody), Nautilus Elementary and Synaptic. But you can easily install extra applications from the repositories. Plymouth and NotifyOSD are also available in the default Bodhi installation. ntfs-config was added to the latest Bodhi Linux 0.1.2 which resolves mounting issues with removeable media. Also, thanks to it, the new 0.1.2 automatically mounts all internal media on system start. Initially, Bodhi Linux was using SLiM but because it didn't play well with Enlightenment, the recent Bodhi versions come with LXDM for a display manager. If you want to use Bodhi Linux on a laptop or netbook, you'll be glad to know Enlightenment has a built-in CPU scaling module that adjusts the processor speed based on system load to save some battery life (this only applies to processors that support it), similar to Battery Status or Jupiter. Bodhi Linux comes with its own repository which includes Handbrake, XCAS, and Geogebra to name a few packages in addition to a current build of the Enlightenment desktop. The Enlightenment packages are updated once or twice a week to ensure you'll always have up to date packages. Besides the Bodhi Linux repository, you'll also find the Ubuntu Partner, Medibuntu and GetDeb repositories added by default which allow you to install / upgrade packages that are not available in the official Ubuntu repositories. 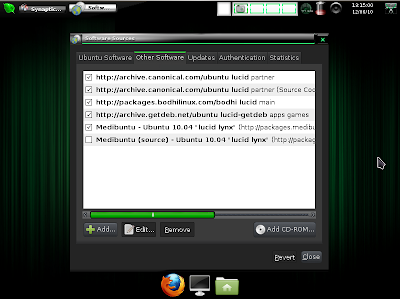 Bodhi Linux will feature an online software center that will use apturl so its users can easily install applications. For this reason, apturl is already enabled by default. The online software center should be live by the end of the year and it should include packages such as: extra Enlightenment modules, Dropbox, Thunderbird, Filezilla, XChat, Transmission, Chromium, GParted and so on. Another cool feature that Bodhi should get by the time it reaches version 1.0 is "offline installers" - these will pack everything (all the dependencies) you need to install a given application in a single package which you can then install on the computer with limited or no internet connectivity. 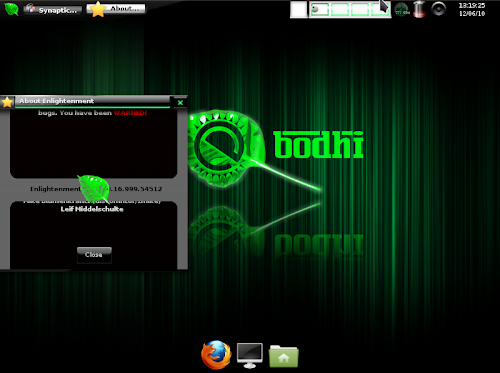 The Offline Installers and Online Software Center are not yet available in Bodhi Linux. The installer is hidden for the moment and you can find it under Settings > All > System > Install Bodhi Linux. This should be fixed soon. More about Bodhi Linux | Bodhi Linux Facebook page. Many thanks to Jeff Hoogland (one of the main Bodhi Linux developers) for the tip, info and patience to answer all my questions!